All Seasons is always looking for motivated people who value quality, team work, and client relationships as much as we do. We offer our team members competitive pay and opportunity for growth. We maintain a variety of landscapes across the Central Coast and are always recruiting experienced and motivated crew members who go above and beyond on a daily basis. Safety and quality are priorities at All Seasons and we offer bonuses for being safety aware and meeting target goals. We offer consistent routes, professional equipment, easy to use scheduling software, knowledgeable crew leaders, training opportunities, and recognition for a job well done! If you are interested in joining the All Seasons team, take a look and apply for one of our positions below. Maintenance Technicians are responsible for maintaining client landscapes, minor irrigation repairs, and using manual and power tools. Must be a team player and willing to work hard. Opportunity for advancement into Maintenance Crew Leader, Operations, or Sales for very motivated people. 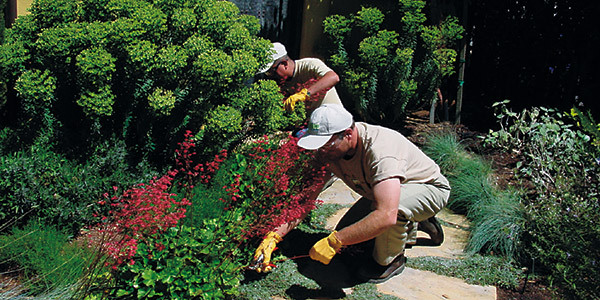 Minimum 1 year experience performing landscape maintenance for a professional landscape company. Must be proficient in use of walk behind mowers, weed whips, hedge trimmers, backpack blowers, rake and scoop shovel, hand pruners, etc. Must have basic knowledge of irrigation and be able to do simple repairs. Must have CA Drivers License (CDL). Must be able to read, write and speak English. Bilingual in Spanish is a plus. Must be available to work Monday through Friday. Maintenance Crew Leaders are responsible for evaluating client landscape maintenance needs and priorities, creating long term plans for maintaining properties efficiently, ensuring work is completed and properly cleaned up, and performing more complex landscape tasks such as irrigation repair and analysis, pest control, and advance pruning and trimming. Crew leaders are also responsible for field level management of their team member. Opportunity for advancement into Operations or Sales for very motivated people.